Travel is evolving and with it are its travel agents. While travelers no longer seek to just travel, but to explore and experiences, the need for the travel agent has been replaced with a ‘travel designer’. A person planning minute-detail service with expertise of travel coupled with an empathetic touch. Different from the sellers of travel, a travel designer establishes a deep personal connection with the travelers to cater to needs. The understanding of the travelers and his/ her requirements is the call of the hour. Connection must be developed with the client before offering any service to them. Indian Holiday Pvt. Ltd (IHPL) is a National Award winning company providing their expertise in travel and tourism sector for 29 years. 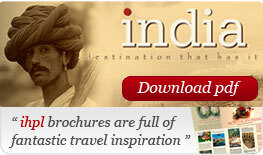 With changing time, IHPL has branched out in providing expertise services of travel designers in India. In fact, one of the best in the field for its luxury services. We understand client’s requirements and design the best possible itineraries and tours. The luxury segment of travel in India has been our forte’ since our inception. We have successfully created cherished travel experiences for all. Catering to luxury in all forms, our services help our clients have the best experiences of India in every way! We connect with client and are dedicated to provide the best travel services for exclusive experiences. Travel designers are a new category of highly-evolved travel agents. While the agent is mostly a seller, a designer is more of an organizer of every detail of travel. Offering personalized service at each step of travel, the designer has to understand the traveler, needs, requirements and expectations. An expert in travel with the skills for designing itineraries from scratch, looking at every angle and possibility, so that travelers have the best of experiences. Having made a name for themselves, travel designers cater particularly in the luxury space. Their services are based on service looking at every possibility rather than logistics. It’s not just travel bookings, hotel reservations and itineraries, it is a tailor-made itinerary that offers unique travel experiences. Every client query, every travelers’ dream has to be analyzed and nurtured in a way that is develops a deep bond. The personal connection will reflect on the customized itinerary, thoughtfully designed in a way that an artist creates a painting. Travel Designers provide travel services which is very different from travel agents, concierges, planners, advisors and many more of the same field. A designer, designs in a method that travel is an experience, worth cherishing a lifetime. Creating itineraries from scratch, tailoring very specifically to client’s needs, requests, the designer brings forth an experience, a deeper personal connection.